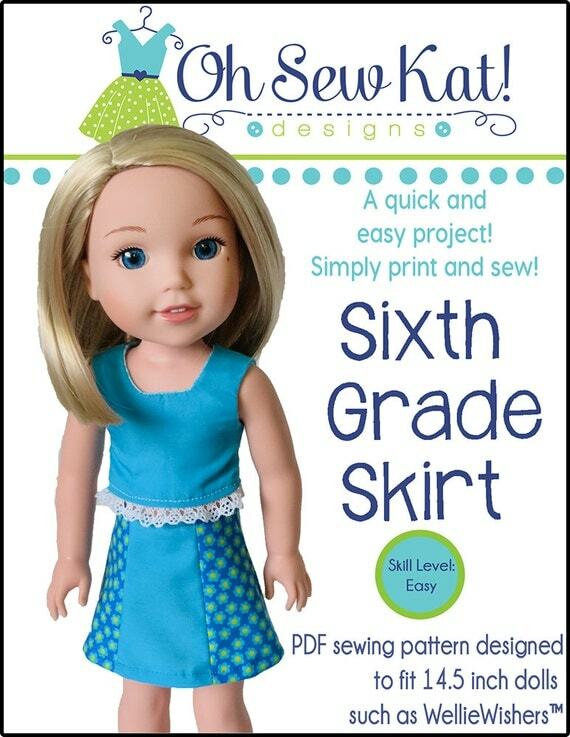 Don’t you love making special doll clothes for the girls in your life with the easy PDF sewing patterns from Oh Sew Kat! The easy to follow photo instructions are designed to help even the novice sewist have a successful time. In many of my more recent patterns, I’ve started to include some ideas and simple instructions for variations on the patterns. You can “Step them Up” or “Step them Down” to your heart’s content. Read below to see five of my favorite (and most popular to date!) pattern hacks. Click on the photo to go right to the tutorial of Kat’s favorite pattern hacks. Find all these patterns, plus many more in 5 popular doll sizes in my Etsy Shop or other places Oh Sew Kat! patterns are sold. Take a new twist on Oh Sew Kat! PDF sewing patterns with these favorite pattern hacks. Tee shirt Dress tutorial: Make a cute, tee shirt dress from the Simple, Sweet Tee Shirt pattern. Works for any size doll. 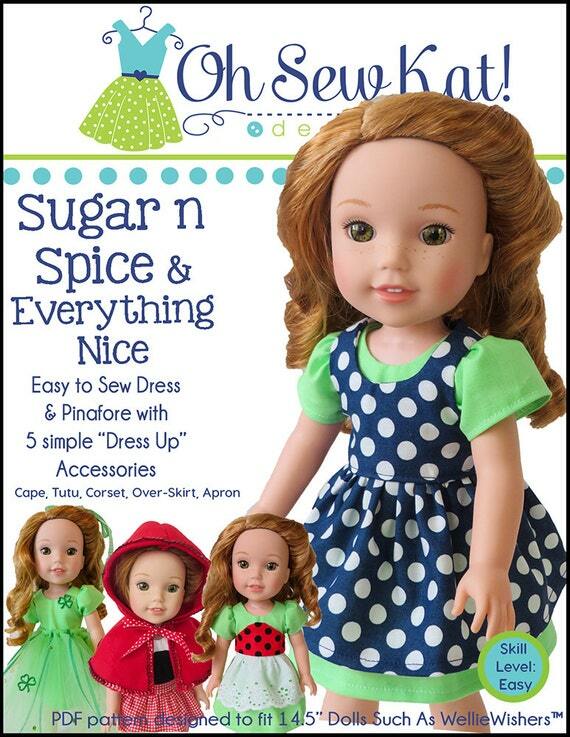 Find the pattern in 4 popular doll sizes here. Pumpkin jumper: The classic Boardwalk Boutique pattern doesn’t have to be put away when the weather gets cooler. Use it as a base to make cute holiday themed outfits as well as summer play clothes. A little orange fabric and an iron on pumpkin face took this simple halter top to a cute jumper for fall. Layer it over a Playtime Peasant Top or a Jumping Jack Turtleneck! 50s overskirt dress: This one isn’t even a pattern hack. Make a 50s or 60s classic look dress with an overskirt for Melody or Maryellen. The Sunshine Dress is worn underneath an overskirt made from the Sugar n Spice and Everything Nice pattern. Make a Halter Maxi Dress: This easy hack to the Boardwalk Boutique lets your fabric shine with one or two big ruffles. Add lace to a ruffle skirt: Take your skirts to a new level with an added lace layer. See this easy tutorial for any ruffled skirt- shown with the Four Season Skirt and Playtime Peasant Twirl Skirt patterns. 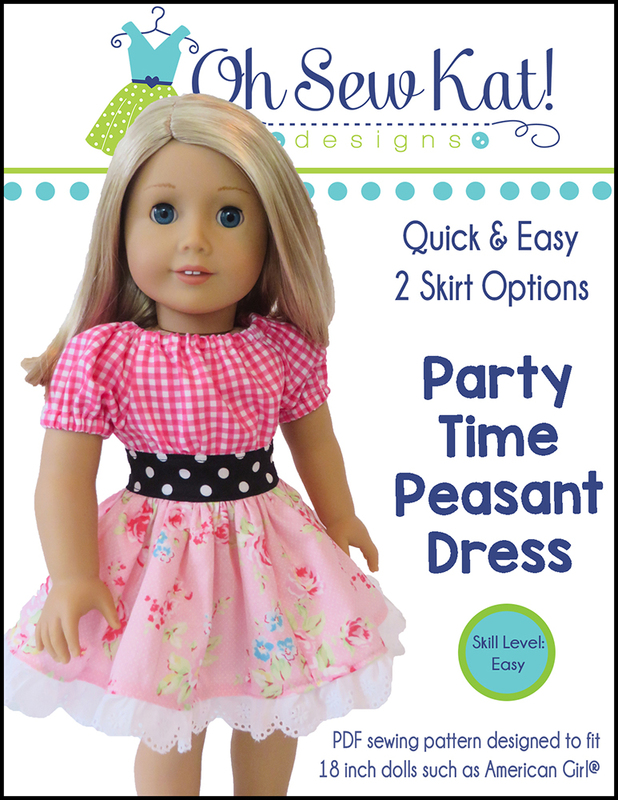 Easy to sew Pattern Hacks for 18 inch and other sized doll clothes. Find all these patterns, plus many more in 5 popular doll sizes in my Etsy Shop or other places Oh Sew Kat! patterns are sold. See more pattern hacks and tutorials HERE. Make this easy apron, with fabric or felt. Use the Oh Sew Kat! Boardwalk Boutique PDF Sewing pattern for this quick and easy pattern hack. You only need the FRONT pattern piece. This pattern hack is super easy if you just use felt, but you can certainly use other fabric and fun materials like fringe, cotton balls, jingle bells, htv, vinyl, embroidery, scraps, felt etc. I used felt for my samples because I wanted a “no fuss” project, which is also very inexpensive and available at every craft store. You only need to print the front pattern piece. 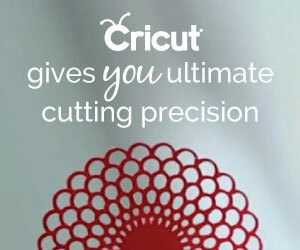 On your paper pattern piece, measure over 1/2 inch from the center fold and draw a new fold line. Cut off the extra 1/2 inch and use this as your new center fold line. Cut off all of the seam allowances, top, sides, and bottom. (Especially if using felt, which does not fray.) . Draw a line across the top from where the front meets the strap, to your new fold line. This “fills” in to make a top that goes straight across. If you like the look of the squared off front, just realize you will have to trim those edges in step 5. For the length, measure up 1/4th to 1/2 inch up from the “Cut here for ruffle” dashed line and draw a new line. Use this as your new hem line. Cut out the front pattern piece on the fold of your fabric. Do not cut into the square neckline, leave that filled in so it’s straight across the top. Using a heat and bond product, or a careful edge stitch, add a 1/2 inch wide, black ribbon across the middle to form the belt. Trim even with the apron sides. Add lace or a white band across the bottom, turning in each side’s raw edge by 1/4th inch. If you want to add a Santa beard, or a pointed elf collar, cut them from felt, and bond or sew them to your apron. Cut 2 straps (also of bias tape) 30 inches long. Mark the center of each strap and place it at the middle of the armhole. Place your apron in between the bias tape and pin in place, working your way out to the edges, attach the bias tape and when you sew, continue the seam from one end to the other so the strap is sewn together and the apron is sandwiched in between. Try it on your doll and trim the straps to the length you prefer with a diagonal cut. If you used bias tape, you will not need to turn in the raw edges. Using ribbon, a buckle, or glitter heat transfer vinyl, cut a one inch belt buckle and attach it to the apron. Add buttons, bells, pom poms etc (glue or sew on) if desired. SNAP or Hook and Loop Tape VARIATION IDEA: Cut your ties to 18 inches each. After you finish the apron, try it on your doll and add velcro or snaps at the neck and waist, trimming off the long ties for a more fitted, easier to put on apron. It’s the perfect way for your doll to keep her special holiday dress clean! Would you rather a full outfit for your doll? Find the Elf, Santa, and Gingerbread outfits from this same pattern HERE. Find my 5 Favorite Holiday pattern hacks HERE. Shop for the Boardwalk Boutique pattern in 4 sizes HERE. 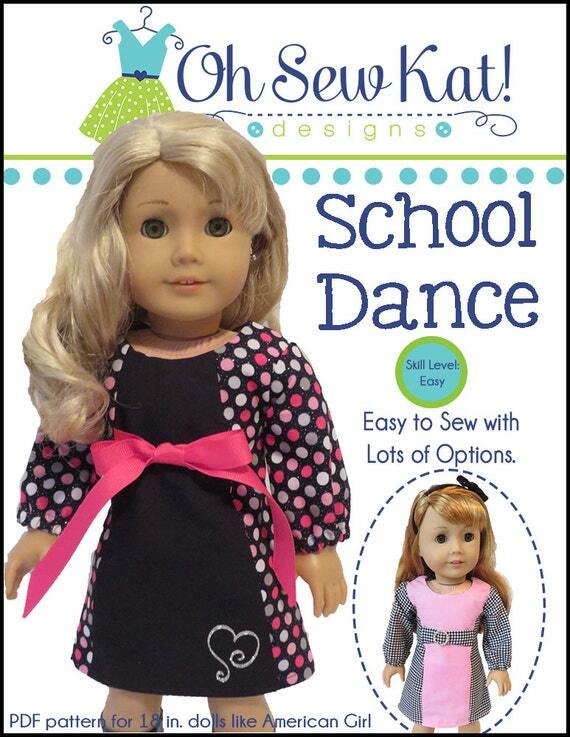 It’s so fun to sew doll clothes for the holidays with easy and quick PDF patterns by Oh Sew Kat! Below I’ve gathered up a few pattern hacks for you to share the holiday love this season! Click on the photos to go right to the tutorials. These pattern hacks can be made for any size doll. You can find all of these patterns, plus many more in my online shops, like MY ETSY SHOP. Snowman Outfit: How cute is this outfit? Use the Jumping Jack pattern, all in white, to make a cute snowman themed outfit that also gives you basic pieces to mix and match with other outfits. This pattern is also available for Wellie Wishers™. Holiday Santa, Elf and Gingerbread: The classic Boardwalk Boutique pattern is a popular pattern for summer halter tops and ruffled capris. But wait! You can use it all year long. Use it as a base to make cute holiday themed outfits! I just used some creative colors to whip up these quick and easy holiday cuties. Layer them over a Playtime Peasant Top or a Jumping Jack Turtleneck! Molly’s Holiday Dress: This one isn’t even a pattern hack. Make a beautiful dress that looks like the classic made by AG for Molly McIntire with the Sugar n Spice and Everything Nice pattern in a deep green with a little lace. This would also be adorable in red! Make a holiday nightgown: This white nightgown is perfect for the holidays and was inspired by Clara in the Nutcracker. A few changes to the Sugar n Spice pattern is all it takes! Santa Jumping Jack: The Jumping Jack pattern can also be used to make a cute Santa outfit. White cuffs on the turtleneck and a black belt! 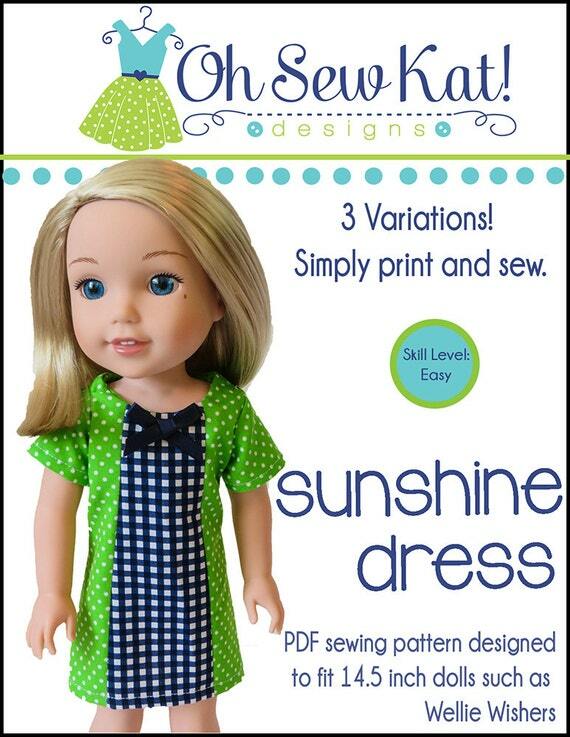 Shop my full catalog of over 50 PDF doll clothes sewing patterns HERE. Find more holiday doll dress ideas here and here. Make a Christmas Elf or Santa Outfit with the Boardwalk Boutique Sewing Pattern by Oh Sew Kat! No, it’s not too early for this! It’s really not. Do you know there are less than 80 days until Christmas? You need to get your sewing started now and I’ve got a few adorable outfits to inspire you! You may have seen these images on instagram or facebook, but they are just too cute not to be shared here as well! Wouldn’t Luciana make an adorable Elf on the Shelf? I was working up some holiday ideas, specifically an apron using the Boardwalk Boutique top as a base (details coming in November), and then it struck me. Why not just use the whole outfit? I immediately set to work and came up with these cuties!! No changes to the pattern- just add some belts, buttons, and ric rac and make some deliberate color choices. I also think a snowman version would be adorable too! They fit perfectly over the Jumping Jack Turtleneck Shirt or a short or long sleeve Playtime Peasant Top. And who says the Gingerbread Boy has to be a boy? 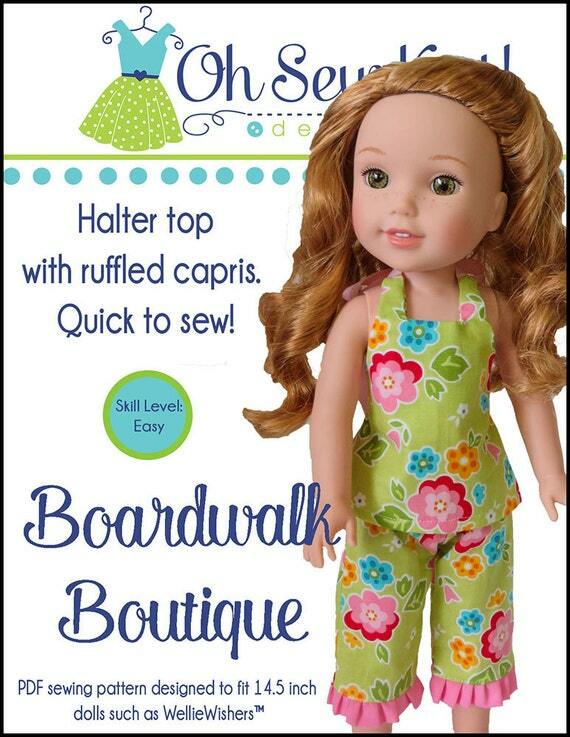 Find the very easy Boardwalk Boutique Halter Top and Capri pattern HERE in 4 popular doll sizes. Pin these images for later and see more Holiday Outfits for your dolls HERE. I used ribbon ties for all of these outfits to keep them quick and easy. They take so little fabric (less than a fat quarter!) and are so fast, you could really stock up for your fall craft shows with these! I tried the elf outfit with and without a ruffle tucked into the neckline. Depending on the shirt you layer with it, both look cute! Just be sure to attach the belt (I stitched black ribbon across the front and made a buckle with glitter HTV.) before you sew the side seams. A little ric rac and some red and green buttons create an easy Gingerbread outfit. Add some fun striped socks and layer it over a Playtime Peasant Top for a complete outfit. (Red high tops are made by AG). Have you started sewing for the holidays! Share what you make with me on Facebook and Instagram (hashtag #ohsewkat). Still soaking in the pumpkin spice? See this same pattern stitched up like a pumpkin HERE. Need a santa hat to complete your outfit? Find one for free here at YouCanMakeThis. Look!! It’s the same pattern!! Download and Sew Your Own Today. Sewing for Maryellen Larkin? Try these twists on patterns from Oh Sew Kat! Find all of these patterns in my Etsy Shop: www.etsy.com/shop/ohsewkat. Click HERE for a tutorial to make a cute headscarf for your doll! Find more ideas to sew for Maryellen HERE and HERE. It’s time to celebrate the red, white and blue here in the USA! Here are a few 4th of July inspired outfits made with Oh Sew Kat! patterns. Click on the photos to go right to the pattern. Melody looks adorable in Bloomer Buddies! Kendall shows her pride in Party Time Peasant Dress (photo credit: Amy Violet’s). 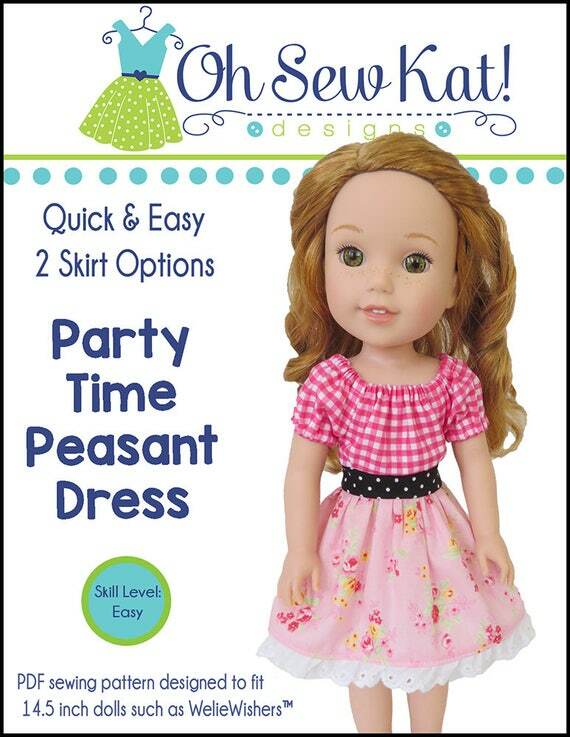 Sam is also in a Party Time Peasant Dress. The Bitty Twins are ready for a picnic in their HalterAlls. Summer classic: Popsicle Top and Sixth Grade Skirt. Emily and Mary keep cool in Popsicle Tops and Sandbox Shorts. Nina Self made this cute version of Boardwalk Boutique. Ashley Crawe has Bitty Baby all decked out for the holiday in a Popsicle Top and Sixth Grade Skirt. Willa and Kendall look cute in their Popsicle Tops and Four Season Skirts. 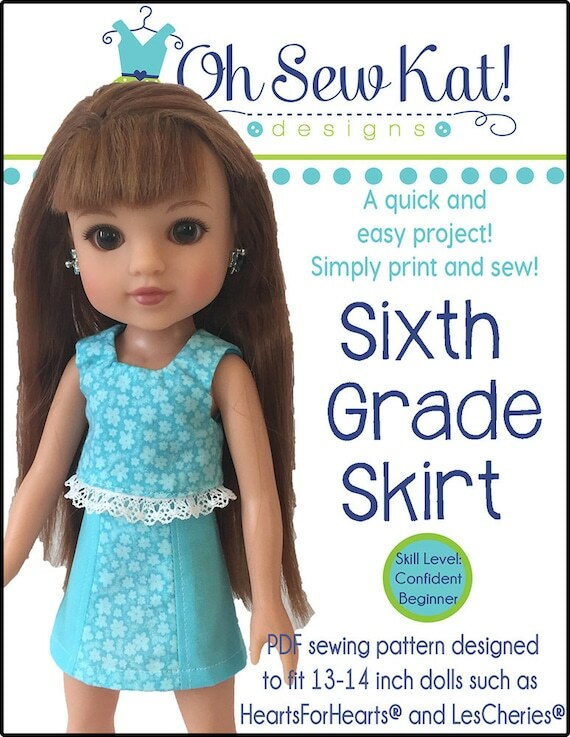 Step it Up Series: How to Make a Patchwork Top for Dolls – Try this Fun Pattern Hack! Try something new today! Do you have lots of scraps or small pieces of fabric? My mother was a big quilter, and she was always buying those cute little 5 inch square packs of fabrics. Here is a great way to turn those small pieces into cute, one of a kind doll clothes. Use any sewing pattern to create a unique, one of a kind, patchwork doll top. The fabrics in this tutorial came from a pack of 5″ squares, called a “charm pack”. This one is by Doodlebug Designs- I love the whimsical images. None of the squares are big enough to make 18 inch doll clothes, so I picked a few of my favorites and patched them together, quilt style, to make my own fabric! I used the Boardwalk Boutique pattern for this cute, halter top, but really any pattern will work to give the same effect. Choose your fabrics and lay them out on your table in a pleasing way. Try to offset the colors and place the rows so you don’t have a four square in the center of your top (unless you are going for that look 😉 . Ensure that your squares cover enough space for your entire pattern piece. With right sides together, sew the pieces together in rows, moving from bottom to top with 1/4th inch seams. Once you have your two rows complete, put them right sides together and sew them together to make a larger square or rectangle. Press all of your seams open. If needed, trim the edges so your fabric piece is neat. Pin your pattern pieces to your new patchwork fabric (being mindful of one way designs) and cut out as usual. Once you have your pieces cut out, simply assemble the pattern as usual. Ta da!! 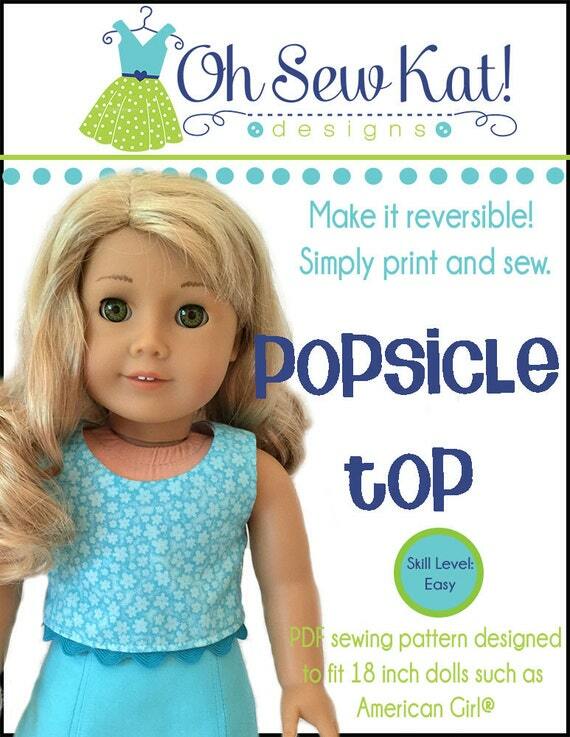 You’ve made a one of a kind top for your doll! 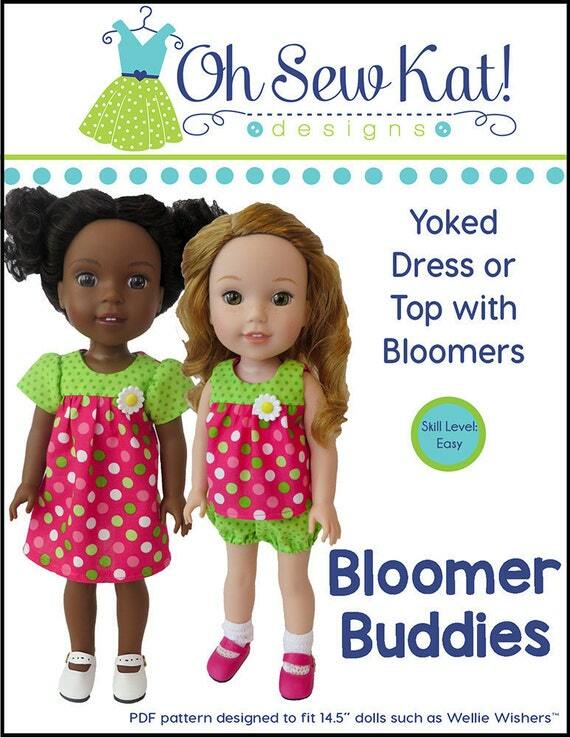 Make unique and special doll clothes with easy to sew patterns from Oh Sew Kat! Find more tutorials for the Boardwalk Boutique pattern here and here. I love getting emails or seeing posts of the amazing outfits you all make with my patterns. I was blown away by these outfits that Michele Anderson sewed and shared. I hope you enjoy them too! I love the entire ensemble!! Here is Snow White. She is wearing a Sunshine Dress (made into a top- so cute!) and the capris are from the Boardwalk Boutique pattern. Ariel is wearing a Sugar n Spice Dress with the reversible corset. Anna looks so sweet in her Sugar n Spice dress. And that purse is adorable!! Merida is dressed in a sundress made with the Boardwalk Boutique Halter Top. The contrasting ruffle looks great with her hair! And here is Belle, in her Boardwalk Boutique outfit. Thank you so much for sharing, Michele!! It’s so hard to pick a favorite! Which one do you like best? Find these patterns for Disney Animators, along with patterns in other popular doll sizes in my Etsy Shop. Spring has arrived, which means that summer is just around the corner! 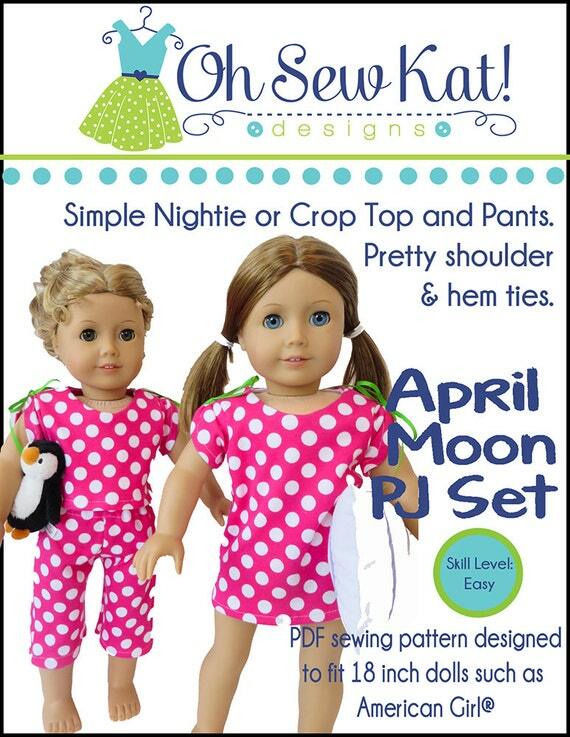 Are you sewing doll clothes for your dolls? 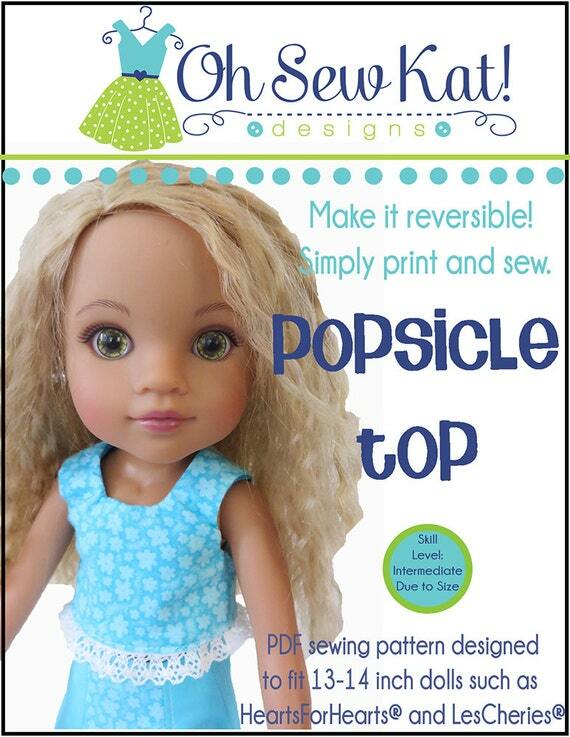 Your dolls will be cute and cool in their Boardwalk Boutique Halter Top and Capris! Or maybe try something new and stitch it up as a simple sundress! Enjoy these simple variations of this popular Oh Sew Kat! PDF sewing pattern. 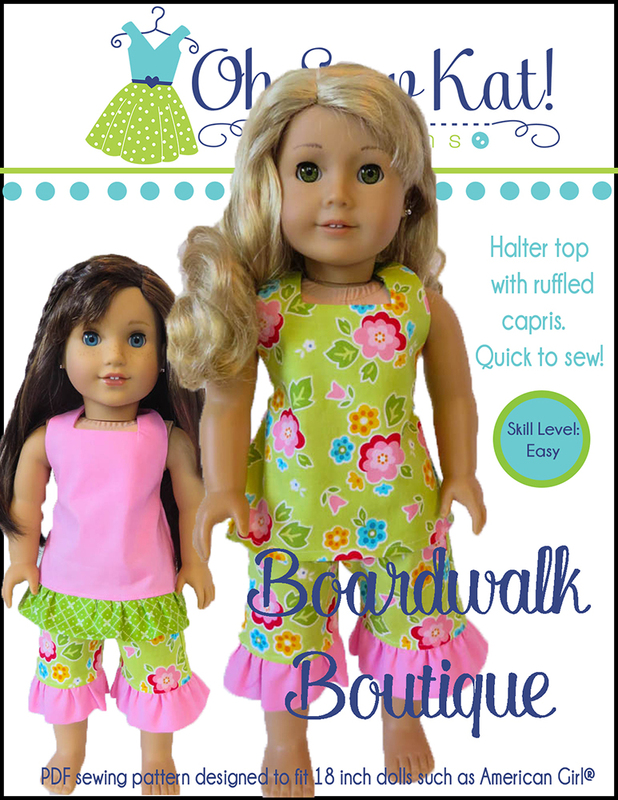 Add a pleated detail to the easy Boardwalk Boutique sewing pattern for a cute doll top. Nanea is ready for the beach. I cut this yellow top off the center fold, to have extra fabric to make a little, center pleat. The extra fullness in the top is cute! 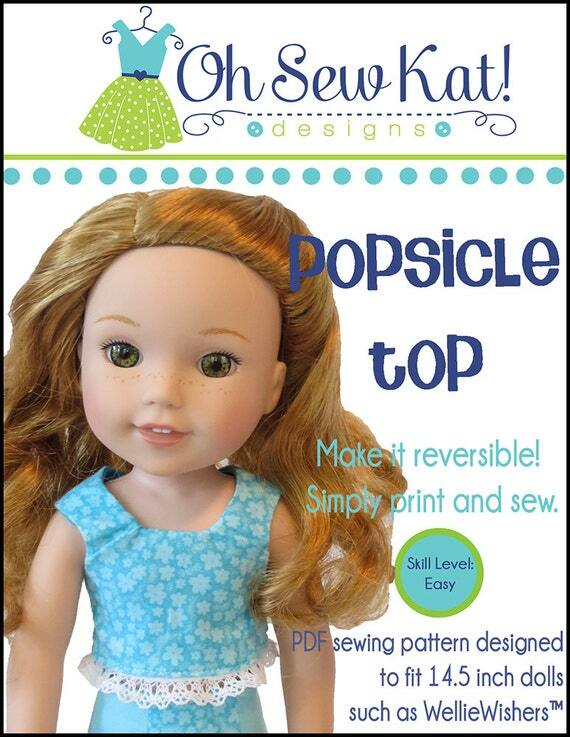 Make a ruffled sundress for your doll. Have fun with ruffles!! Cut the longer top version and add a very tiny or very wide ruffle. Saige is ready for fun in her sporty, halter sundress. Cut the longer top version and leave off the ruffle. Add some pretty trim for a sporty sundress! Add a twist to the Boardwalk Boutique halter top with a pretty, eyelet lace. Use pretty eyelet lace to make the back look special! Find the full TUTORIAL HERE. 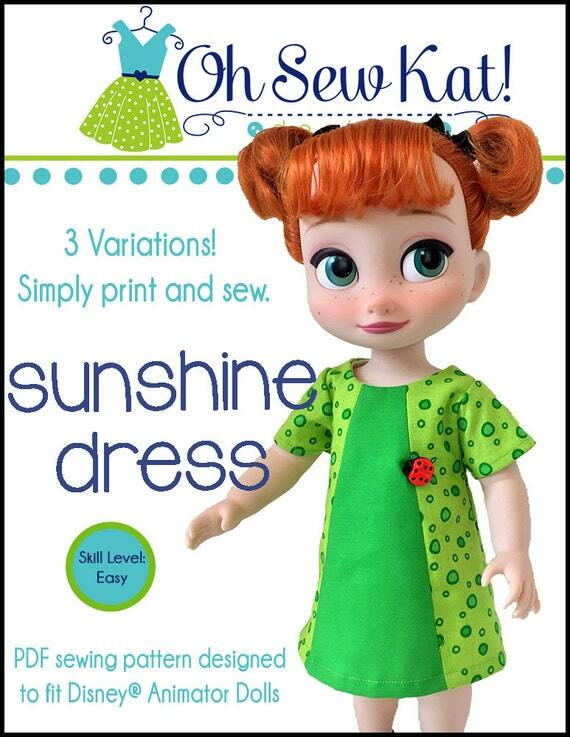 Make a maxi sundress for your Julie doll and her 18 inch friends. Double your ruffles and make it a maxi dress!! Find the full TUTORIAL HERE. 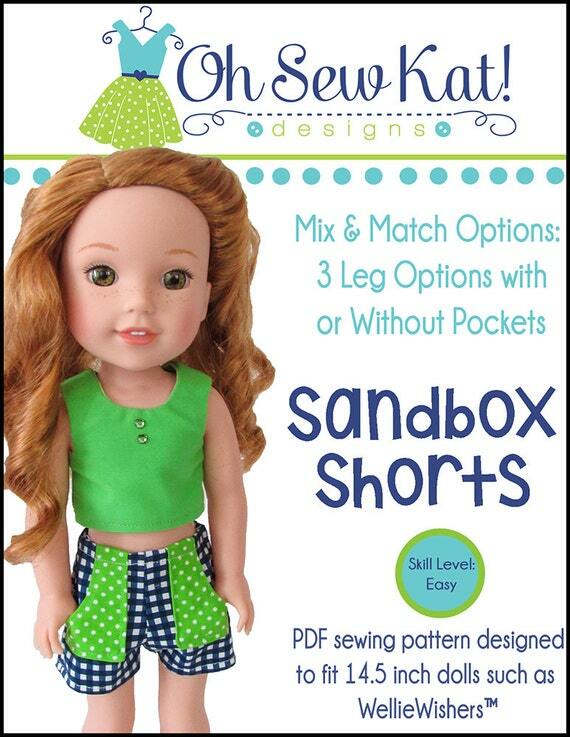 Make a doll outfit for the beach with sporty bloomers too! Or simply try the halter top with something different on the bottom. 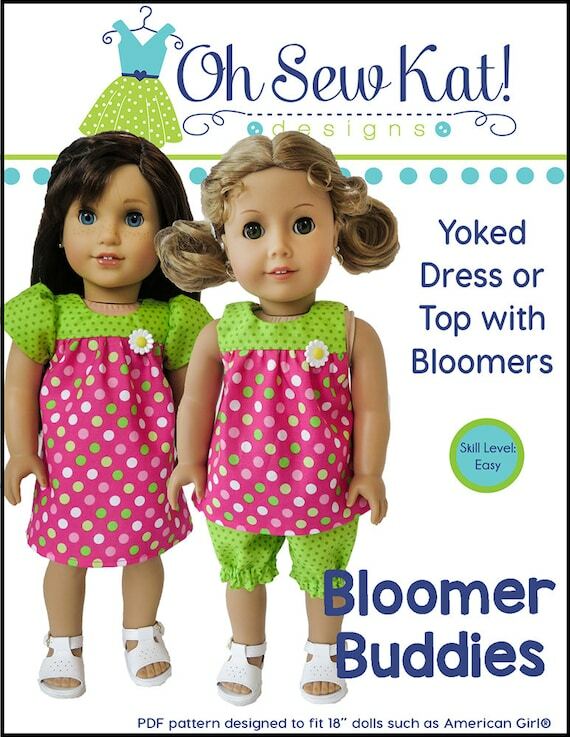 Here, Maryellen is wearing the standard halter top with the shortie length bloomers from the Bloomer Buddies pattern. How will you make your Boardwalk Boutique for your doll this summer? See more Boardwalk Boutiques here and here. Find the pattern for bitty baby, animators’, and wellie wishers in my etsy shop.